I created a set of 6 ATC’s for 7 Dots Studio using the Cotton Candy Dreams collection. I added layers of texture in the background using inks, gel, stencils and stamps. The focal point on each card was created with the chipboard pieces from the same collection. The stalks for the dandelions were created with the poppy stencil from the Homegrown collection. 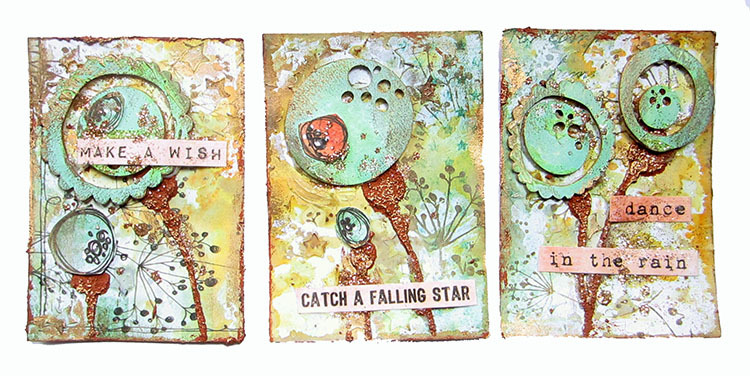 Watch the video below to see how I created these Artist Trading Cards. Очень понравилась серия АТС !! Такие романтичные !